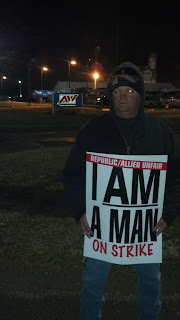 The Republic Services/Allied Waste strike that began in Youngstown, Ohio, on Thursday spread to Elyria, Ohio, today. In a show of Teamster solidarity, 197 members of Local 20 are honoring the picket line set up by this Local 377 landfill striker from Republic's Carbon Limestone landfill outside of Youngstown. Trash tycoon Bill Gates owns about 26 percent of Republic. The greedy billionaire is giving money to improve sanitation overseas, but doesn't seem concerned about Republic's horrendous environmental record in the U.S. The striking Teamsters are exercising their rights under federal law to strike over Republic illegally changing working conditions without bargaining and the company’s continued refusal to provide pertinent information related to bargaining. 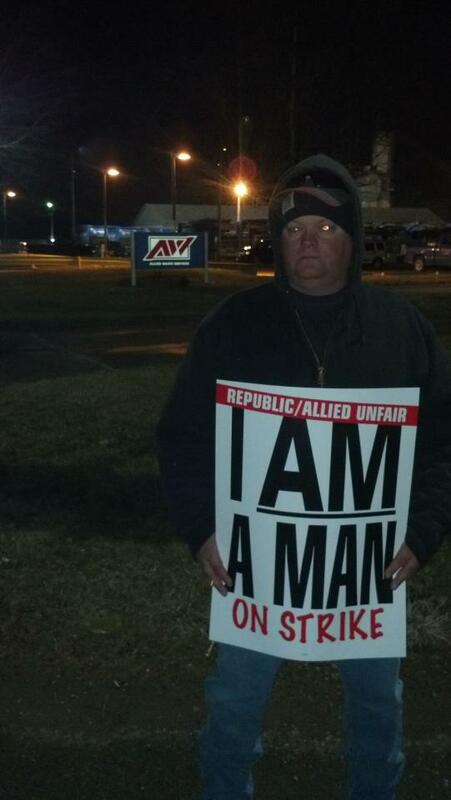 Teamsters who struck in sympathy are back on the job today in Evansville, Ind., and Urbana, Ill. Meanwhile, Republic hired scabs in Youngstown. Watch the video here for a scary look at scabs driving the wrong way down a street in Youngstown.